This is my friend's daughter. I used her photo for drawing. Doug's Note: The drawing is lifelike and expressive. It has good dramatic use of lighting. Highlights in the hair, face, and clothing tie the whole drawing together nicely. 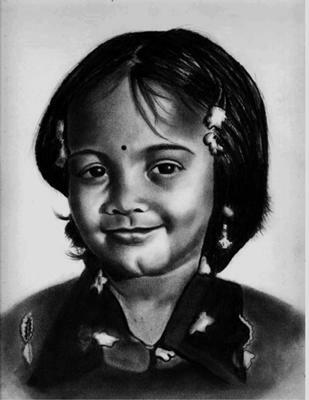 I was attracted to this sketch immediately because the girl shares the same name as mine.I bet she is from Indian origin.And it's a big relief to see that the name has been written perfectly.Even my teachers can't write my name properly,because they think it's difficult.They always omit few words.And she is cute too.Great work Mr. Prakash.